Hay fever involves an allergic reaction to pollen. The health care provider will perform a physical exam and ask about your symptoms. You will be asked whether your symptoms vary by time of day or season, and exposure to pets or other allergens. Allergy testing may reveal the pollen or other substances that trigger your symptoms. Skin testing is the most common method of allergy testing. If your doctor determines you cannot have skin testing, special blood tests may help with the diagnosis. 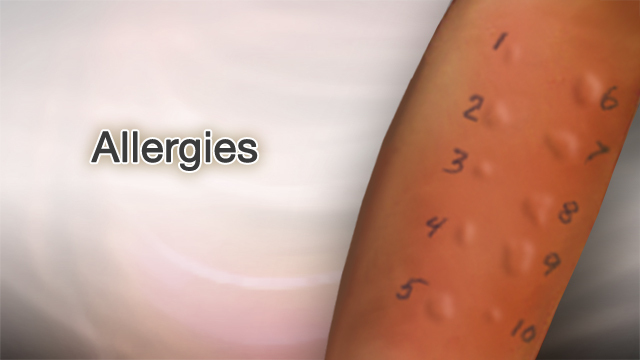 These tests, known as IgE RAST tests, can measure the levels of allergy-related substances. A complete blood count (CBC) test, called the eosinophil count, may also help diagnose allergies. The best treatment is to avoid the pollens that cause your symptoms. It may be impossible to avoid all pollen. But you can often take steps to reduce your exposure. You may be prescribed medicine to treat allergic rhinitis. The medicine your doctor prescribes depends on your symptoms and how severe they are. Your age and whether you have other medical conditions, such as asthma, will also be considered. 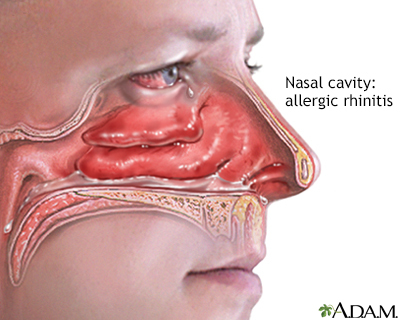 For mild allergic rhinitis, a nasal wash can help remove mucus from the nose. You can buy a saline solution at a drug store or make one at home using 1 cup (240 milliliters) of warm water, half a teaspoon (3 grams) of salt, and pinch of baking soda. Many antihistamines taken by mouth can be bought without a prescription. Some can cause sleepiness. You should not drive or operate machines after taking this type of medicine. Others cause little or no sleepiness. Antihistamine nasal sprays work well for treating allergic rhinitis. Ask your doctor if you should try these medicines first. Nasal corticosteroid sprays are the most effective treatment for allergic rhinitis. They work best when used nonstop, but they can also be helpful when used for shorter periods of time. Corticosteroid sprays are generally safe for children and adults. Many brands are available. You can buy four brands without a prescription. For all other brands, you will need a prescription from your doctor. Decongestants may also be helpful for reducing symptoms such as nasal stuffiness. Do not use nasal spray decongestants for more than 3 days. Leukotriene inhibitors are prescription medicines that block leukotrienes. These are the chemicals the body releases in response to an allergen that also trigger symptoms. Allergy shots (immunotherapy) are sometimes recommended if you cannot avoid the pollen and your symptoms are hard to control. This includes regular shots of the pollen you are allergic to. Each dose is slightly larger than the dose before it, until you reach the dose that helps control your symptoms. Allergy shots may help your body adjust to the pollen that is causing the reaction. Instead of shots, medicine put under the tongue may help for grass and ragweed allergies. Most symptoms of allergic rhinitis can be treated. More severe cases need allergy shots. Some people, especially children, may outgrow an allergy as the immune system becomes less sensitive to the trigger. 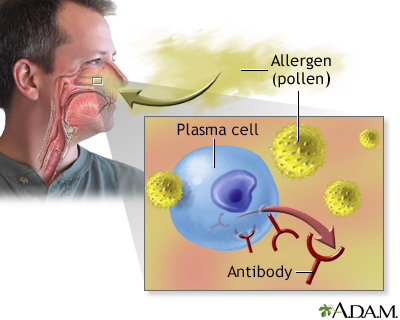 But once a substance, such as pollen, causes allergies, it often continues to have a long-term effect on the person. You can sometimes prevent symptoms by avoiding the pollen you are allergic to. During pollen season, you should stay indoors where it is air-conditioned, if possible. Sleep with the windows closed, and drive with the windows rolled up. Baroody FM, Naclerio RM. Allergy and immunology of the upper airway. In: Flint PW, Haughey BH, Lund V, et al, eds. Cummings Otolaryngology: Head & Neck Surgery. 6th ed. Philadelphia, PA: Elsevier Saunders; 2015:chap 38. Corren J, Baroody FM, Pawankar R. Allergic and nonallergic rhinitis. In: Adkinson NF Jr, Bochner BS, Burks AW, et al, eds. Middleton's Allergy: Principles and Practice. 8th ed. Philadelphia, PA: Elsevier Saunders; 2014:chap 42.